Typical of the Ilocano dishes are the vegetables. Grown from the Ilocano’s backyard, every dish is laden with vegetables. Because of its nutritious yet bland taste, commonly added as a condiment is the patis or fish sauce. Ilocano’s most famous dish is pinakbet. It is a combination of vegetables like okra, squash, bitter gourd (ampalaya), eggplant, and string beans cooked in ¬bagoong (shrimp paste). Some varieties of pinakbet is cooking this dish with grilled fish; others also use stir-fried pork and several spices. Dinengdeng is another famous Ilocano dish. It is made from malunggay leaves and fruit boiled with bagoong and commonly eaten with grilled fish. The malunggay is a very nutritious green leafy vegetable that belongs to the horseradish tree. Dinengdeng is very simple and easy to cook. It is similar to other native dishes in the Philippines but the inclusion of fried or grilled fish makes it different from bulanglang and laswa. A carnivore person may like bagnet of Vigan, a deep-fried pork belly crisped and seasoned with bagoong. Bagnet is so popular that local tourists who travel to Vigan will always bring home bagnet. With its popularity, bagnet now is used as the meat in many ordinary recipes, making such recipes catapult to fame because of bagnet. 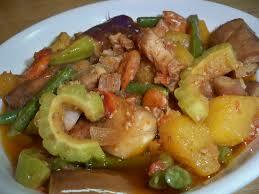 For example are dishes like Pinakbet with Bagnet, Sinigang na Bagnet, Bagnet Kare-kare, and other dishes. Philippine cuisine has definitely been BAGNETIZED by this crispy pork belly from Vigan. A fatty sausage called longanisa is flavored with garlic and vinegar, and a popular breakfast in every Filipino table. There are other sausages in the Philippines but Vigan longanisa captured the hearts of many diners because of its unique flavor. As a native delicacy, people will always look for these sausages when they visit Ilocandia. As Filipinos are fond of eating and creating dishes from the native delicacies, there is no doubt that eating can be more fun when you visit Ilocos Region.